Heat 1 tbsp olive oil in a small pan and fry the garlic until soft. Add the stock, bring to the boil, then add the peas and mint. Simmer gently for 20 minutes, then remove the mint, and purée the peas and stock. Push through a sieve into a clean pan, stir in the crème fraîche and season with salt, pepper and nutmeg. Reheat when ready to serve. Clean the scallops by removing the tough white muscle attached to the middle, and the black intestinal thread. Rinse and pat dry. Heat an oven-top griddle pan, and at the same time a small frying pan, both on a medium-high heat. Add the bacon to the frying pan and fry until crisp. Drain on kitchen paper. 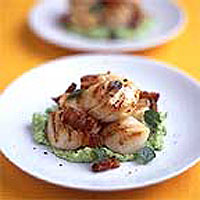 Toss the scallops in 1 tbsp olive oil and cook in the griddle pan for 2-3 minutes, turning regularly. Serve immediately: swirl a circle of hot pea purée on each of 4 warm plates. Divide the scallops between the plates, and scatter with the bacon.